In a few short days, the doors will finally swing open on The Oxbow Hotel, a brand-new boutique hotel at 516 Galloway St. in downtown Eau Claire. On Sept. 28, the 30-room lodge will start housing its first guests, and on first impression, one can tell The Oxbow is doing the hotel game a little bit differently. Originally built in 1947 as the Edwards Hotel, which enjoyed a few decades of success, the property was later operated as the Green Tree Inn for many years before falling into disrepair. But in 2013, a team of local entrepreneurs including Nick Meyer (publisher of Volume One magazine), Ben Richgruber (executive director of the Eau Claire Regional Arts Center), Justin Vernon (of Bon Iver), and Zach Halmstad (the founder and CEO of JAMF Software) started forging plans to breathe new life into the dusty brick and mortar there and to form a hotel unlike any this city has ever seen. The Oxbow complex is made up of two buildings: The Main House, which holds the lobby, front desk, The Lakely restaurant/bar/venue, a gallery event space, and a handful of rooms and suites; and The Flats, an adjacent wood-adorned motel-style structure with exterior entries to the rest of the rooms and a balcony. 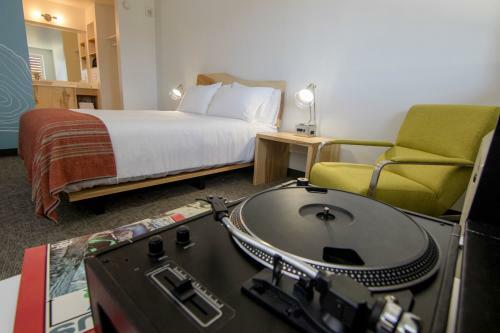 In total, The Oxbow has 30 rooms, each curated to exude a modern lodge vibe, oozing with Eau Claire style. 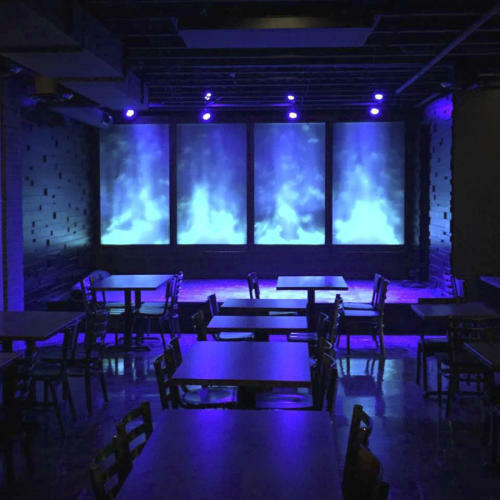 Rather than just giving their guests a bed, a pillow, and a TV, The Oxbow’s team instead tasked themselves with curating the Eau Claire experience for all their guests. It’s true. 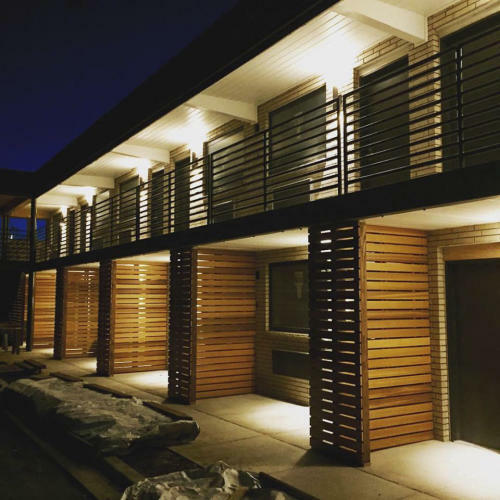 What separates The Oxbow from other hotels in the community is surely the attention to detail and the local-specific elements that you just won’t find anywhere else. The meticulous room accoutrements are designed to make visitors feel like they’re at home in Eau Claire, doing as the Eau Clairians do. 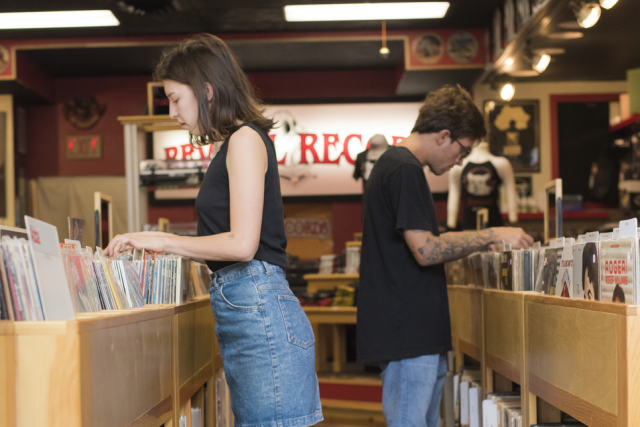 There are record players in every room (with records in the lobby for you to check out), handcrafted furniture that uses repurposed urban wood, original screen prints by regional artists on display (which you can purchase right off the walls), and depth charts of nearby lakes used as interior design accents. Even the mini-bars are stocked with strictly Wisconsin delicacies. 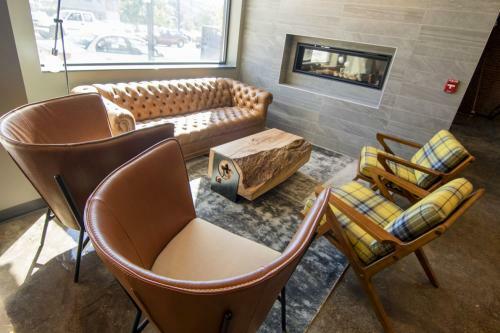 With The Oxbow’s close proximity to the Chippewa and Eau Claire rivers plus the multitude of nearby bike trails to access, a cool aspect of the stay package is the adventure outfitter. This fall guests can borrow bikes (singles, tandems, or Burleys), this winter they can try snowshoes and cross country skis, and next spring they’ll add kayaks and canoes – all so they can get outside and explore our treasured waters and see our unique landscape firsthand. The card key to every room features the phrase: “Unlock your next adventure.” The Oxbow team is hoping their guests will do just that, soaking up as much of the Chippewa Valley as possible during their stay. The Oxbow is definitely the place for the Wisconsinite in everyone’s heart. It is enthusiastically ready to bring people from all over the world into downtown Eau Claire to see what our little city is all about, show them why we’re proud to live here, and give them a chance to fall in love with it, too. 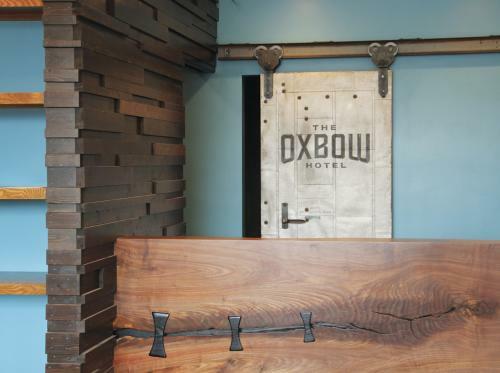 To learn more about The Oxbow Hotel and The Lakely or to make a reservation, visit theoxbowhotel.com or follow them on Instagram and Facebook.